Lesson 16 in Primary Manual 4 is about Alma & Amulek in prison and the purpose of the lesson is to help the children develop faith in Jesus Christ so they will stand for the right. You can see the entire lesson HERE. During the lesson you teach about the faith that Alma & Amulek had even when they were being persecuted and how they defended their faith through it all. 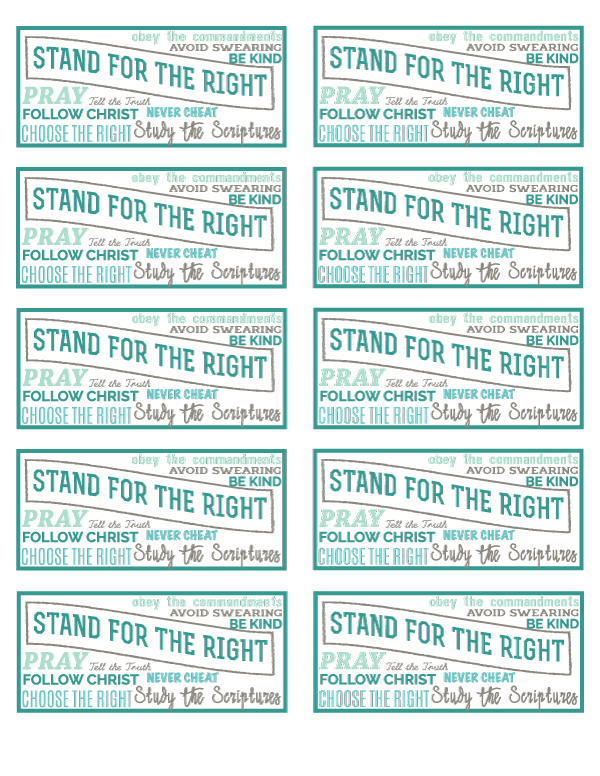 This handout has ways the kids can remember to stand for the right in their own lives including: obey the commandments, avoid swearing, be kind, pray, tell the truth, follow Christ, never cheat, study the scriptures and choose the right. You can download the print layout HERE. I use my home printer which is a Brother Printer for all my lesson handouts. It prints great color prints and I love that I can print up to 11x17 pages! After watching THIS youtube video I purchased the Refill Kit for Brother Ink . I've been printing a ton and haven't even made a dent in the ink bottles which has made printing so much cheaper! Basically using my printer totally eliminates trips to the office supply store. I also use a Westcott Paper Trimmer for all paper cutting and I love it, I use it all the time! Every week I laminate the handouts for the kids to put on Binder rings , I use the Scotch Thermal Laminator with Laminating Pouches and I it works great. For my handouts and almost all projects I literally do it all at home, I love being able to print, cut and laminate at home. Thank you so much for sharing your talents. It makes it so much easier to make up my newsletter for my Valiant 10-11 class. Hi Desiree! I'm so glad you can use them, it makes me so happy to share it! Thanks for leaving a comment, it really makes my day knowing someone else is using them!